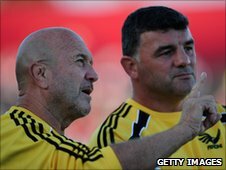 Former Wales defence coach Rowland Phillips has been made head coach of Italian Magners League outfit Aironi. The board of the Italian franchise took the decision following the defeat against Glasgow Warriors on 5 November - the side's eighth straight defeat. Phillips takes over from Franco Bernini, who becomes the new technical Manager of the franchise. "I'm very, very pleased to have this opportunity, but the challenges are big ahead of us," said Phillips. "My position as head coach will be until the end of the season. My future as head coach will be determined how we do in the next few months." Phillips arrived in Viadana in the summer as defence coach, the same role he covered for Ospreys and Wales. He will take charge of the coaching staff with Andrea Moretti coaching the forwards and Andrew Scotney and Antonio Zanichelli training the backs. The former Ospreys coach Phillips coached Neath before and after a 2006-7 stint with Wales and was at Ebbw Vale last season. Neath won three successive Welsh Premiership titles under Phillips' guidance before he was brought into Gareth Jenkins' coaching team ahead of the 2007 Rugby World Cup. Phillips became defence coach at the Steelmen in November 2009 and took over as head coach in February only to see them relegated at the end of last season.